Our trip began at the M-72 put in with eight intrepid paddlers. 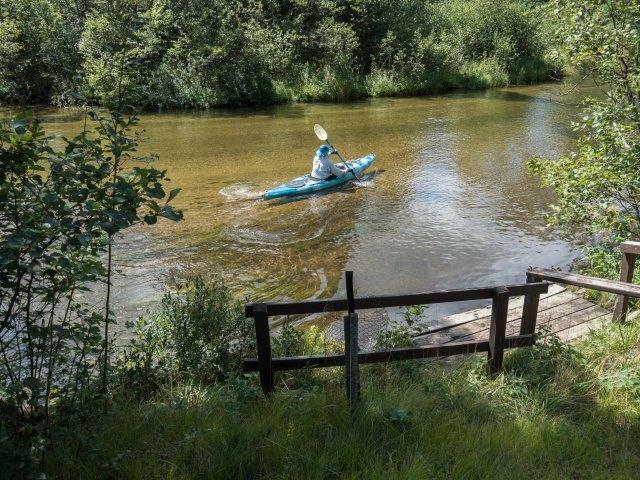 John and Lois in their canoe, and the rest of us in kayaks: Mark Smith, Tracie Lord, Gerald and Sue Wilgus, and Doug and Lindy Barnes. The weather this morning began as clouded over, gray and with a fine mist but eventually turned into a bright, sunny, warm day. The river provided good practice for me, the one very, very beginner in the group. 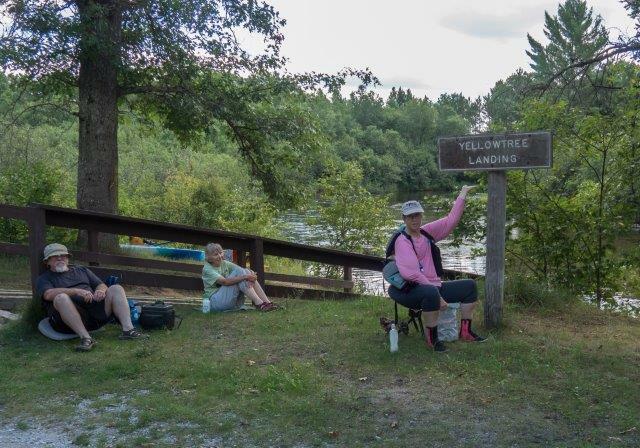 After about 8 miles of paddling we stopped at the Yellowtree Landing for a much needed break and lunch. 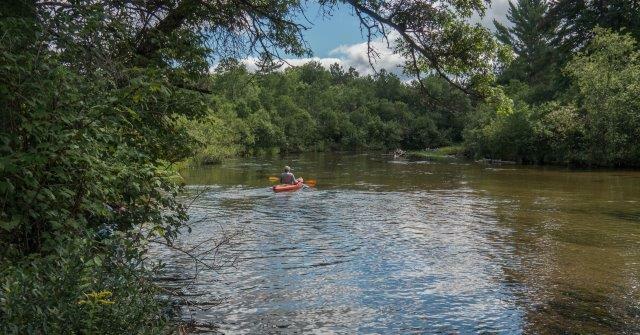 Then back on the river for another 8-9 miles of paddling to our take-out at CCC Bridge. We had sunshine for the remainder of our delightful journey. 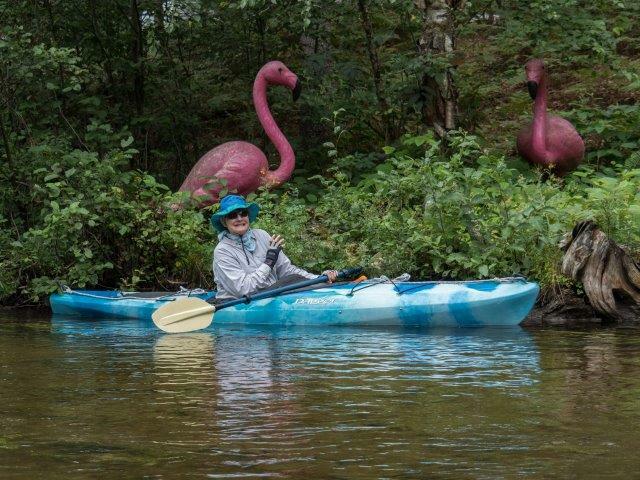 I learned a lot on this trip - about myself and about paddling. I had a lot of great teachers - thank you great teachers :) I would like to say we saw lots of wildlife but we didn’t - just a few pretty female Mallards. No one went over, no one got snagged. It was a fun day, a great day with great people. I, personally, am looking forward to our next river trip (Lower Platte River clean-up) which just happens to be tomorrow, Aug. 29. Sue and Gerry are fans of outrageous lawn kitsch. 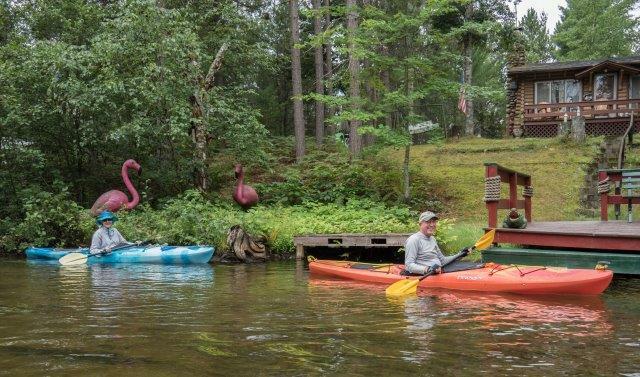 Notice the alligator above Gerald's kayak. Sue was afraid the flamingo might think she was a shrimp and attack. The sign answered the question, "Is it Yellow Trees or Yellowtree Landing?" 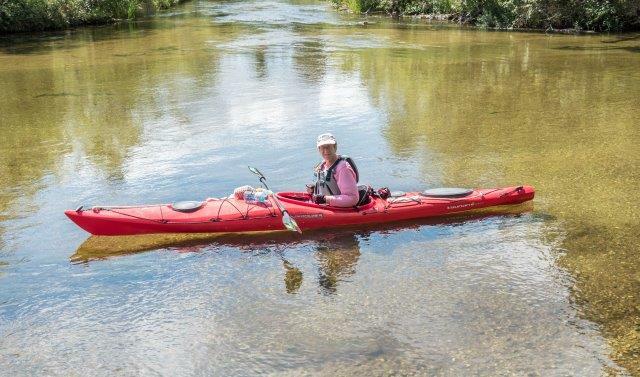 Tracie enjoyed using Linda Pelkey's kayak.